I don't make pork too often, and when I do I often wonder why I don't make it more. Well, I do know the answer - I prefer pork tenderloin, and it's not the cheapest cut of meat! I only buy it on sale, and my local grocery store doesn't put it on sale too often. When they do it's often very picked over, but occasionally I'm able to snag one or three. Because I rarely have pork tenderloin in my fridge or freezer, I don't have many recipes in my arsenal to try, so when I do pick some up I have to look for new ways to make it! Recently I decided to participate in a blog exchange on a cooking board I participate in. The exchange was basically a secret blog exchange - a blog was selected for each participant and you could make anything from the blog for your enjoyment, posting today! 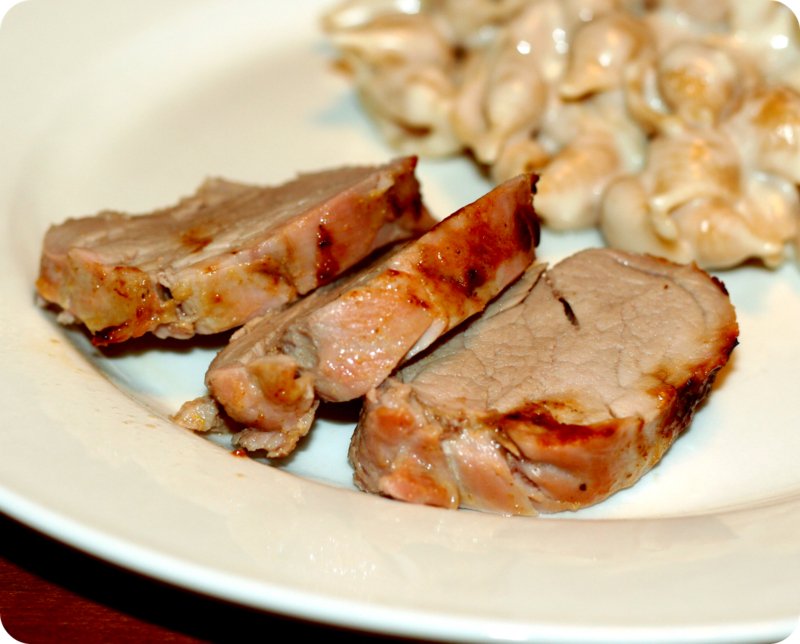 Well, ironically enough, the day our "assignments" were handed out, I was planning on looking up a pork tenderloin recipe, and Barefoot Blue Jean Life, my assigned blog, had just posted a pork tenderloin recipe with a citrus, cumin, pepper marinade. I mean talk about killing two birds! I looked around to see if there was another recipe I was just dying to try, and there are some on my list, however I kept going back to the pork tenderloin because a.) I was already looking for a recipe, and b.) it sounded really good and right up my alley! This recipe is one I will make again, both Rob and I really liked it. It wasn't overpoweringly anything really. I kind of expected a little more citrus flavor, but it was very mellow, which is probably why Rob actually liked it since he isn't a huge fan of citrus flavors, at least not like I am! Combine the orange juice, juice of 1 lime, 1 Tbsp. cumin, 1 tbsp. coriander, S&P and jalapeno with the pork in a large zip-top bag. Use enough orange juice to cover the pork. Marinate for 2 hours. Place the pork in a baking dish large enough (or baking pan), drizzling with a little of the marinade, making sure to getting all of the peppers. Cut a few slits in the tenderloin, and stuff with cloves of garlic. Rub the remaining lime juice and spices on the tenderloin. Cook in preheated oven for about 25 minutes, or until the internal temperature is 160 degrees. Allow to rest for a few minutes before slicing. Good Morning! Happy Friday, I am glad you liked it. I am not a huge fan of citrus but my husband is. Looks great. Your picture is awesome. Sounds great -- I'm always looking for new ideas for pork tenderloin. I love pork tenderloin and this looks great. Thanks for being part of the recipe swap!